+Apparently the trend for fast food joints is Angus. 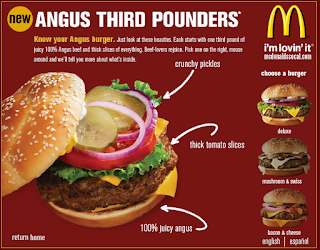 Now McD's is expanding what was a trial in So.Cal for their Angus Third Pounders. There's a minisite at angusthirdpounders where you can get a coupon, give feedback and check out the three varieties of burgers. Shame they couldn't get their arrows to line up to what they are pointing to in their graphics.